The 9C1 G2 Limited Edition is ergonomically built to comfortably fit both large and small hands. The barrel is engineered to sit low for superior point and shoot accuracy and reduced muzzle flip, and the 9C1 G2 has virtually no external protrusions, making it ideal for concealed carry; and of course, it’s Proudly American. 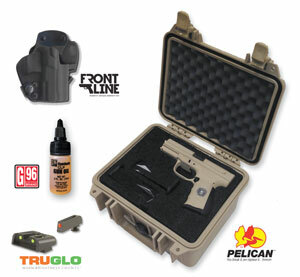 FMK has partnered with Pelican, TruGlo, Front Line and G96, to Honor our U.S. Marine Corps. 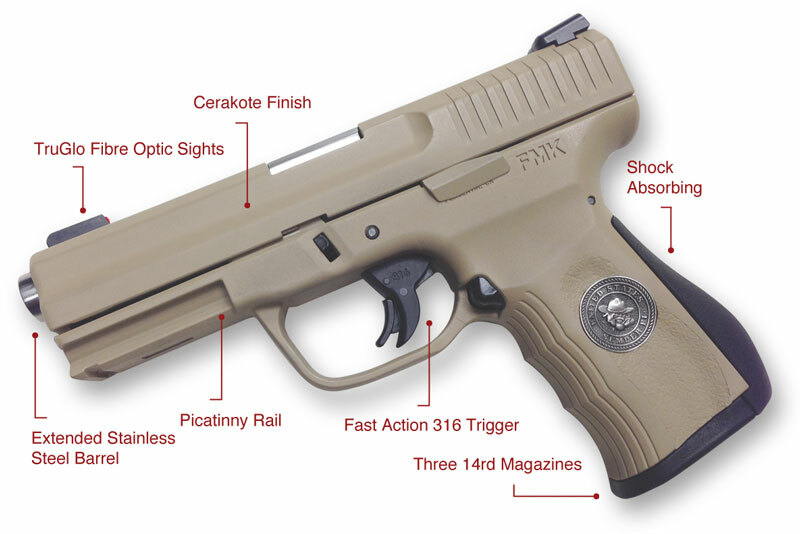 The Limited Edition Package comes with a custom 9C1 G2 pistol; it has a Desert Sand Cerakote finish on the slide, and an extended polished Stainless Steel barrel. Also included are three 14 round magazines, Tru-Glo Fiber Optic Sights, a Front Line Custom Holster, Military Approved G96 Synthetic CLP Gun Oil, and a Pelican Water-Proof Pressurized Case! This limited Edition pistol is a true collector’s item. The pistol will have a limited production, Serial Numbers SBD0001 to SBD2000.